← Hello from Rachel Zhu! Citrix Synergy is at the corner. This event shows how virtualization, networking, storage and cloud technologies work together. NetApp and Citrix have collaborated to ease the implementation of desktop virtualization by making virtual desktops simpler, more cost effective, and more robust for enterprise. This is NetApp first time hosting a hands on lab. In this hands-on session SYN 620w taught by instructors from Citrix, Cisco and NetApp, students will receive design, implementation and best practices guidance on building a Citrix XenDesktop solution with the Cisco Unified Computing System (UCS) and NetApp storage. Students will also gain hands on experience with NetApp by leveraging the NetApp ONTAP management tool to practice advanced configurations and provisioning of storage in line with best practices for hosting XenDesktop. They will also gain experience with using the upcoming NetApp and XenServer/XenDesktop integration that enables server and desktop admins to easily perform storage management, hardware assisted mass VM provisioning, and ensure compliance with storage best practices.You can test NetApp VSC 1.0 for Citrix XenServer, and NetApp Insight Balance. Also come to my session SYN114 on May 11th 2012 10:00-10:45. I hope you have a great time in Citrix Synergy. See you there next week in San Francisco. 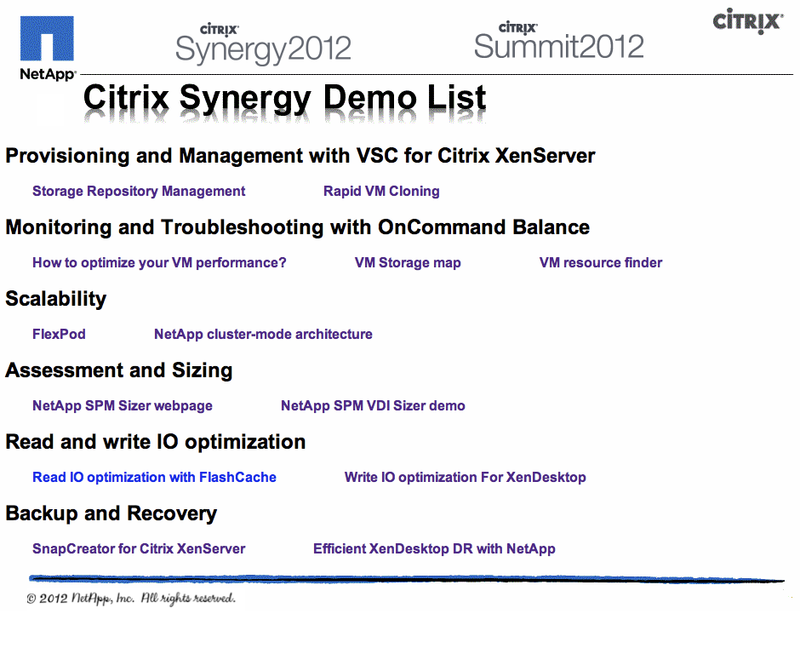 This entry was posted in Uncategorized and tagged Citrix, Citrix Synergy, netapp, storage, VDI, virtualizatio. Bookmark the permalink.